There are weeds overhead. There are weeds Over my HEAD! There are weeds on my roof. There are weeds IN my roof! MY roof is WEEDS! 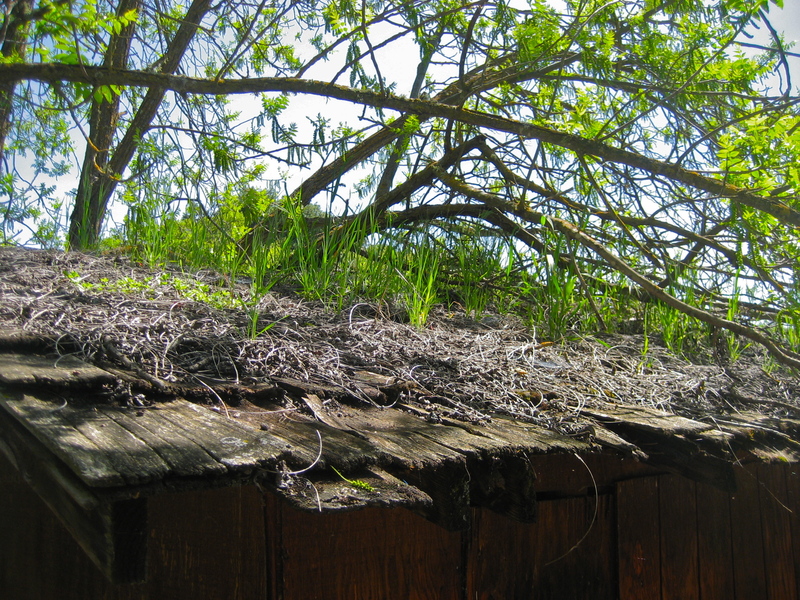 My weeds shelter me, dampen the noise of the thunder, strengthen the fibers of my decaying wooden shingle roof, absorb the rain and divert its piercing forces away from the holes. My weeds shelter life on my roof. My weeds make my roof a living thing. I am living in a living shack because my weeds make it so. Field mice, bugs and the birds that come to eat the bugs all call my roof home. My weed roof sings me to sleep with the night breezes, misplaced grass blades humming with life. Thank you for visiting, and your kind words. Life is a message we all need to hear loud an clear.